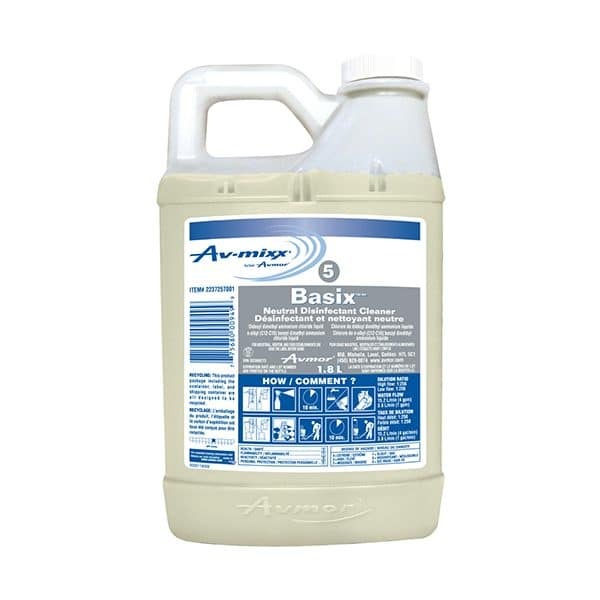 Avmor’s BASIX Neutral Disinfectant Cleaner is a no-rinse concentrated quaternary disinfectant formulated to effectively kill a broad range of microorganisms. Use wherever superior hygiene is required including: schools, hospitals, nursing homes, offices, restrooms, foodservice establishments, and food processing plants. This product can be used on the following surfaces: floors, walls, ceilings, tables, chairs, countertops, telephones, fixtures, glazed tiles, toilets, urinals, sinks, shower rooms, locker rooms and any washable surface where disinfection is required. Remove gross filth and heavy soil deposits. A pre-cleaning step is required and recommended for heavily soiled areas. TO DISINFECT: Add 4 ml per litre of water (1:256) to disinfect hard non-porous surfaces. Apply solution to surfaces thoroughly wetting surfaces with a cloth, mop, sponge or sprayer. Treated surfaces must remain wet for 10 minutes. Allow to air dry. Prepare a fresh solution for each use. DO NOT MIX WITH OTHER CLEANERS. BACTERIA: Acinetobacter baumannii, Acinetobacter Iwoffi, Citrobacter freundii, Enterobacter agglomerans, Enterococcus faecalis, Escherichia coli, Fusobacterium necrophorum, Klebsiella pneumoniae, Micrococcus luteus, Pasturella multocida, Proteus vulgaris, Pseudomonas cepacia, Salmonella choleraesuis, Salmonella choleraesuis serotype pullorum, Salmonella typhi, Serratia marcescens, Shigella flexneri, Shigella sonnei, Staphylococcus aureus, Methicillin Resistant Staphylococcus aureus (MRSA), Antibiotic resistant Staphylococcus epidermidis, Bordetella bronchiseptica, Enterobacter aerogenes, Enterobacter cloacae, Chlamydia psittaci, Escherichia coli Tetracycline Resistant, Klebsiella oxytoca, Listeria monocytogenes, Micrococcus luteus, Pseudomonas aeruginosa, Salmonella enteritidis, Serratia marcescens, Shigella flexneri, Staphylococcus epidermidis, Staphylococcus haemolyticus, Streptococcus agalactiae, Vancomycin Resistant Enterococcus faecalis (VRE), Streptococcus pneumonia Penicillin Resistant, Streptococcus pyogenes, Tetracycline Resistant Pseudomonas aeruginosa, Vibrio cholera, Vancomycin Intermediate Resistant Staphylococcus aureus (VISA), Yersinia enterocolitica. VIRUSES: Avian Infectious Bronchitis virus Beaudette IB42, Canine Coronavirus, Feline Picornavirus, Herpes Simplex Virus Type 1, Human Immunodeficiency Virus type 1 (HIV 1), Infectious Bovine Rhinotracheitis virus, Pseudorabies virus, Transmissible Gastroenteritis virus, Human Coronavirus, Canine Distemper virus, Herpes Simplex Virus Type 2, Influenza A virus, Respiratory syncytial virus, Vaccinia virus. FOR HIV-1 (HUMAN IMMUNODEFICIENCY VIRUS): BASIX Neutral Disinfectant Cleaner, when left with a 10 minutes contact time, is effective against HIV-1 in the presence of organic matter (5% blood serum). Use 4 ml of BASIX Neutral Disinfectant Cleaner per litre of water (1:256). Personnel that clean items soiled with blood or body fluids should be cautioned to wear protective clothing including latex gloves, smock, mask and eye goggles. Cleaning materials and clothing soiled with blood or body fluids should be autoclaved and disposed of according to local regulations. Prepare a fresh solution for each use. FUNGUS: BASIX Neutral Disinfectant Cleaner is also effective against Aspergillus niger. BASIX Neutral Disinfectant Cleaner per litre of water (1:256). Apply solution with mop, cloth or sponge making sure to wet the area thoroughly and let air dry. Prepare a fresh solution for each use. Repeat application at weekly intervals or when mildew growth reappears. STORAGE AND DISPOSAL: Do not contaminate water, food or feed by storage and disposal. Store in a dry place no lower in temperature than 10°C or higher than 50°C. Rinse the emptied container thoroughly. Make the empty container unsuitable for further use. Dispose of the container in accordance with provincial requirements. For information on the disposal of unused, unwanted product and the cleanup of spills, contact the Provincial Regulatory Agency or the Manufacturer.